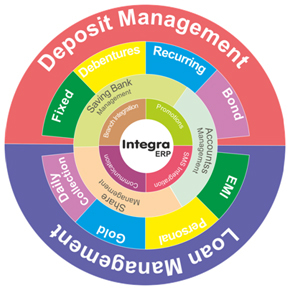 Integra Finance ERP software is one of the most user-friendly software applications for financial service segment like Non Backing Financial Institutions (NBFI), Nidhi Companies, Gold loans lenders, consumer loans providers etc. It integrates all functional modules in to a single solution to provide maximum flexibility over operation and consolidation of business activities. Control over administrative process, real time information flow, head office control over branches and user defined authorization process etc gives proper monitoring ability to the management and decision making will be faster than earlier hence ensure an increased profitability and business turnover.